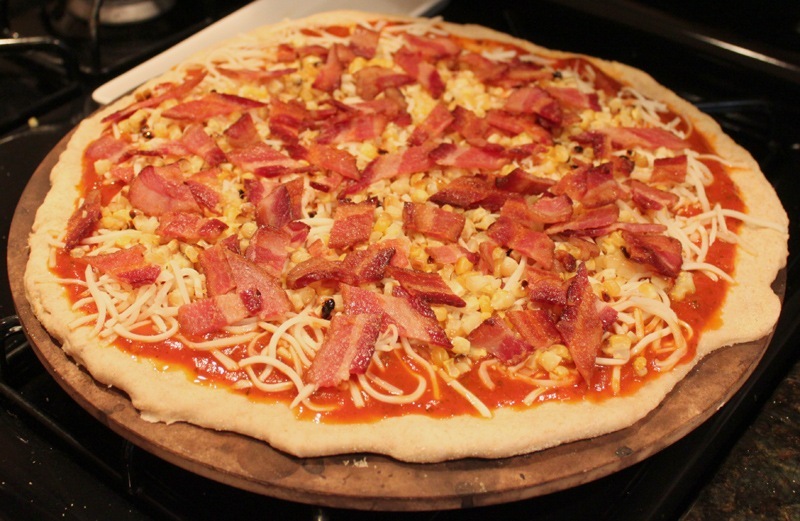 Every weekend we have what’s called Pizza Sunday in the Domestocrat household. 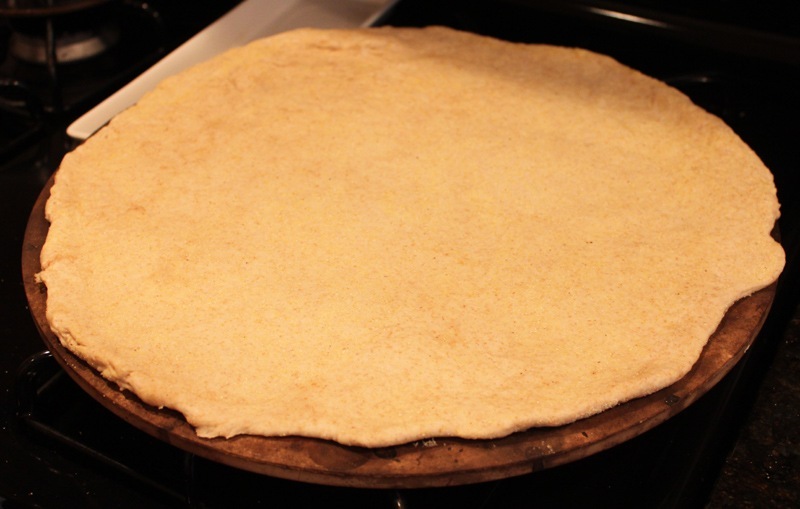 I whip up some homemade pizza dough, we make a delicious pie, and watch TV together (recently it’s been Breaking Bad, Parks & Rec, and football). It’s my favorite part of the week and no matter how busy we get, Pizza Sunday is non-negotiable. 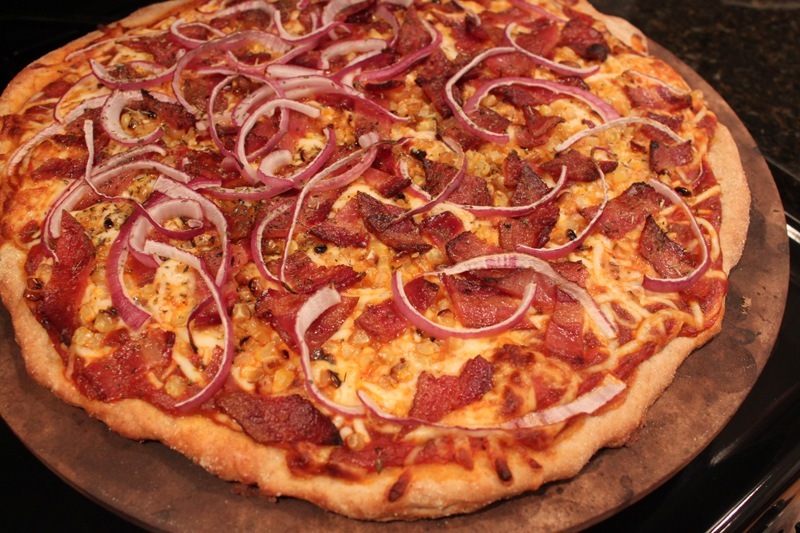 We normally always make the same pizza – cheese and a ton of crushed red pepper for me, a meat-palooza for John. Well, last week I wanted to change up Pizza Sunday and I had some great inspiration. 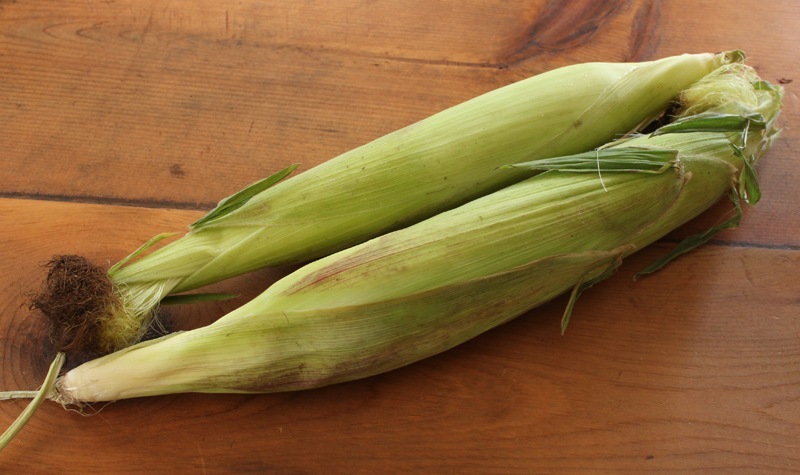 My friend Nicole came over for some crafting and brought two ears of farm fresh corn. I instantly knew they were pizza bound. 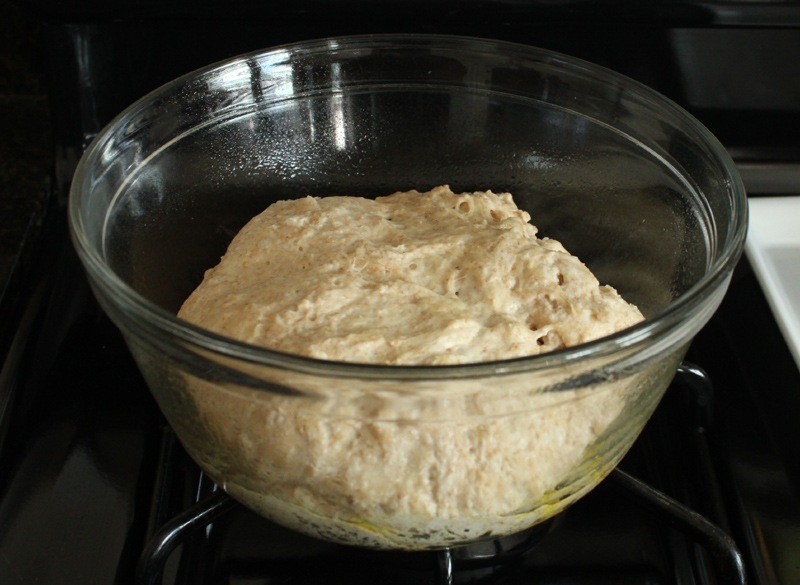 Step 1: Make the pizza dough. 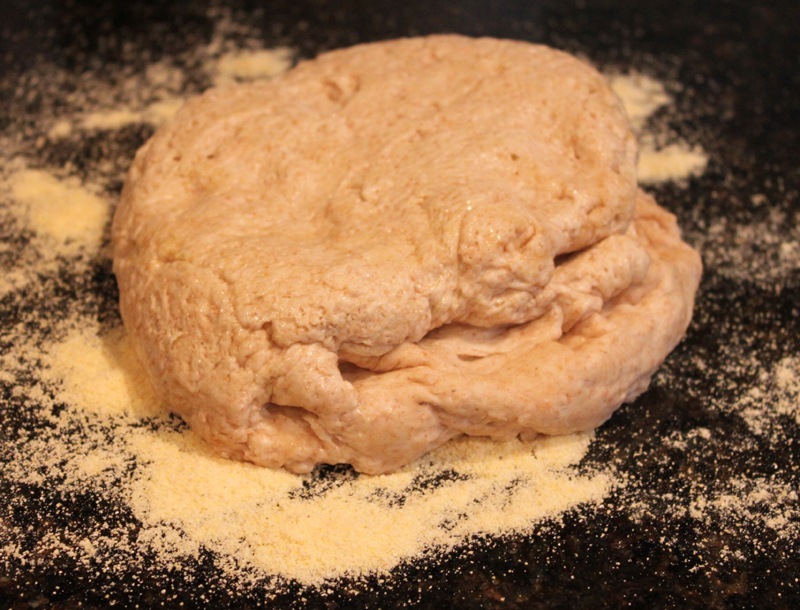 Mix all of the ingredients together, place the dough in a greased bowl, cover with a towel, store in a warm place in the kitchen, and let rise for 3-4 hours. 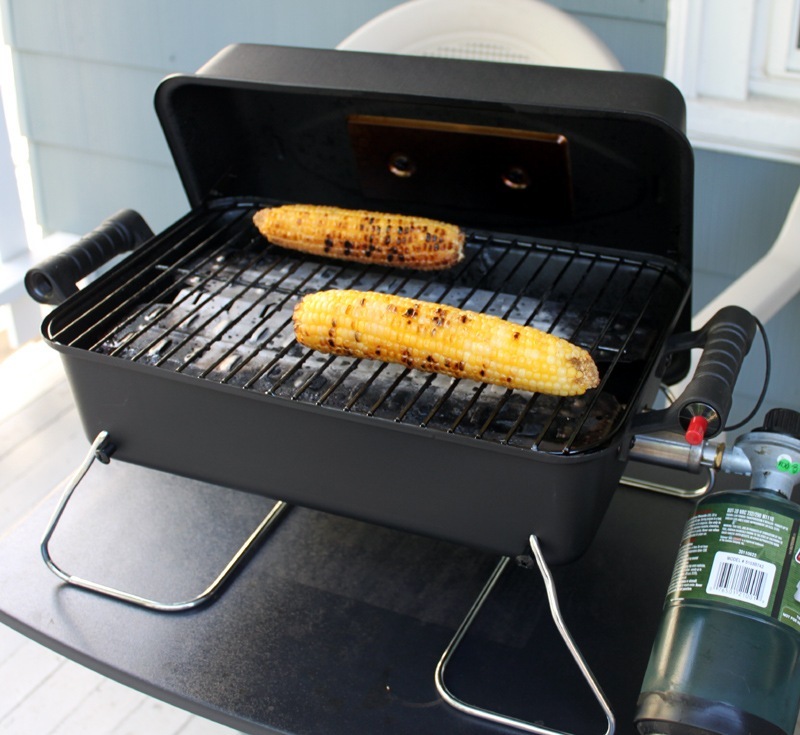 Step 2: About 30 minutes before you plan to make your pizza, grill the corn. Set it aside to cool. 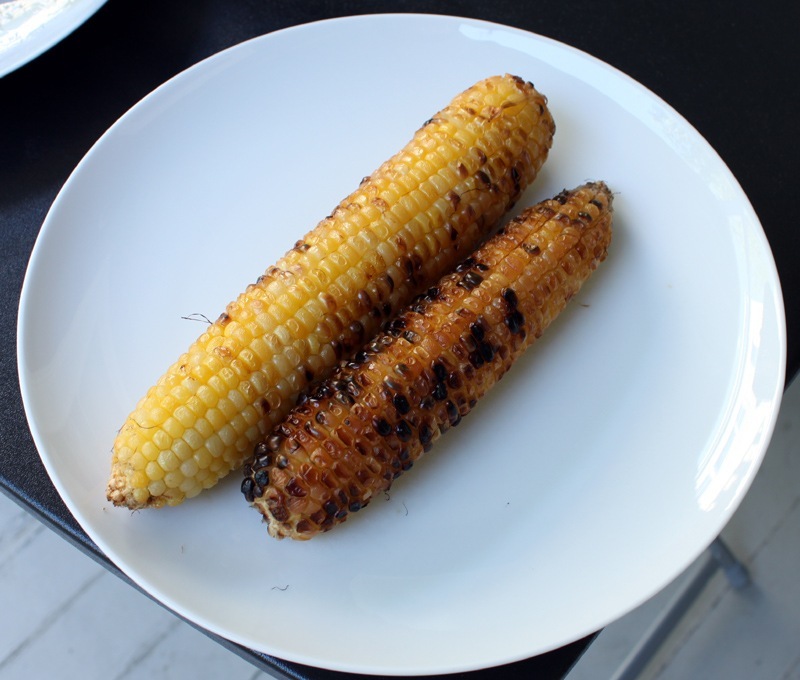 Once it’s cool cut the kernels off the cob. 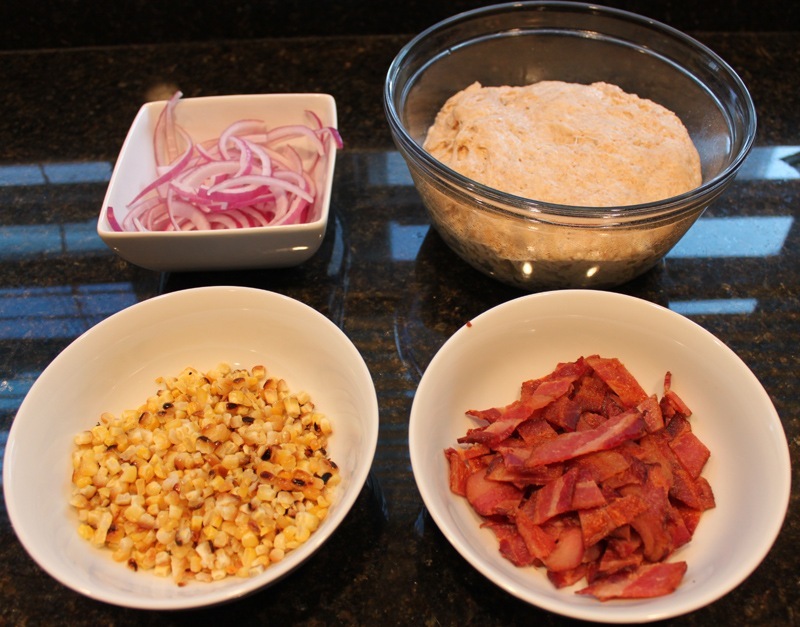 Step 3: About 15 minutes before you plan to make your pizza, cook up the bacon. 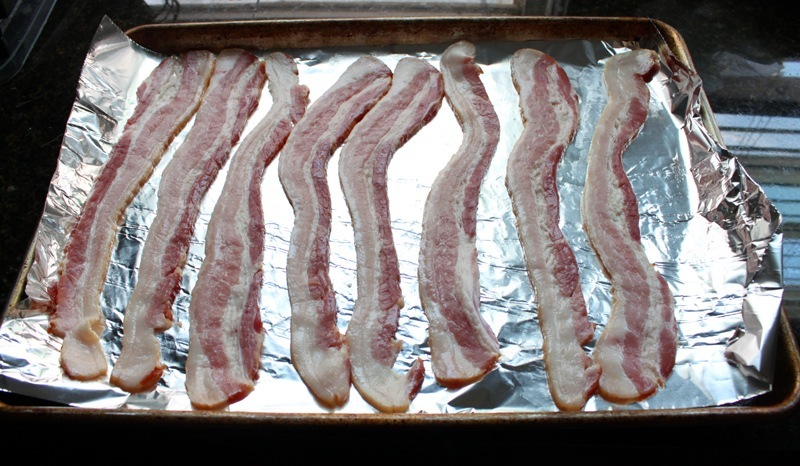 I prefer to bake bacon if I’m cooking more than 2-3 pieces. It’s comes out perfect. Just bake on 350 degrees for 10-12 minutes. 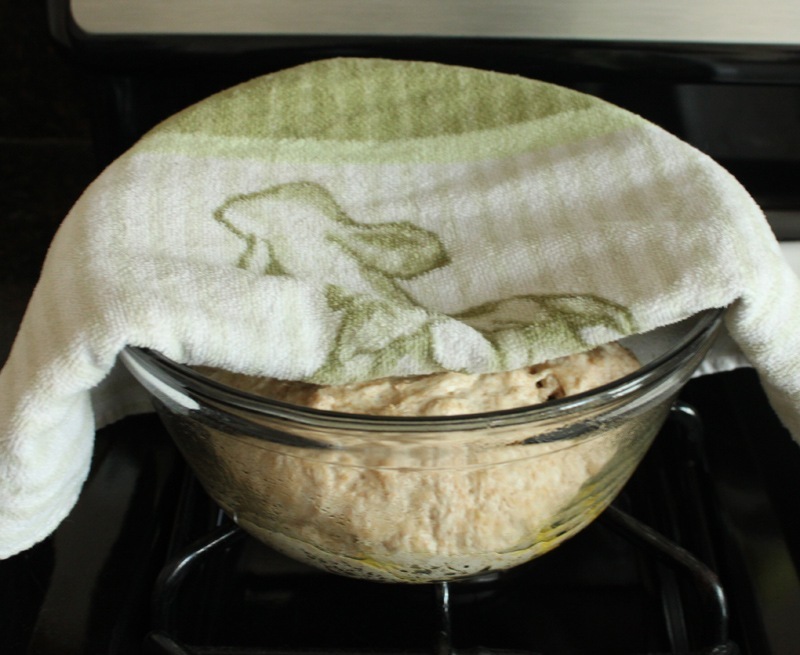 Drain on a paper towel lined cooling rack. 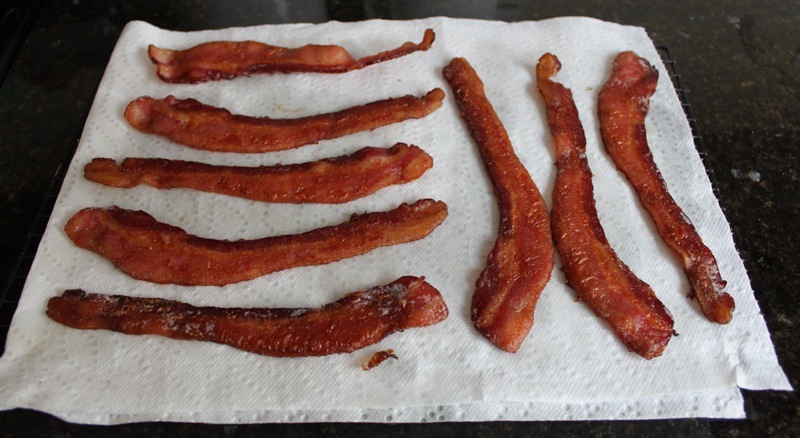 When the bacon has cooled chop it into bite sized pieces. 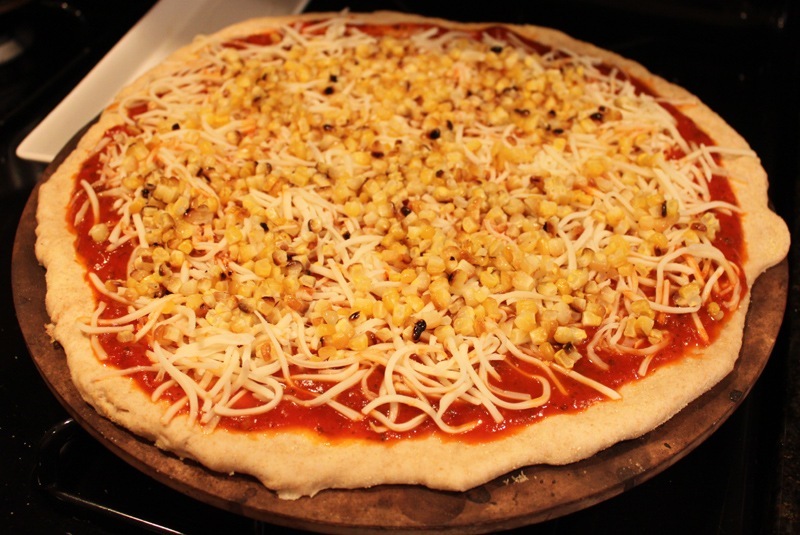 Step 5: Sprinkle the corn meal on a flat surface and roll out the pizza dough. Place on top of the pre-heated pizza stone. 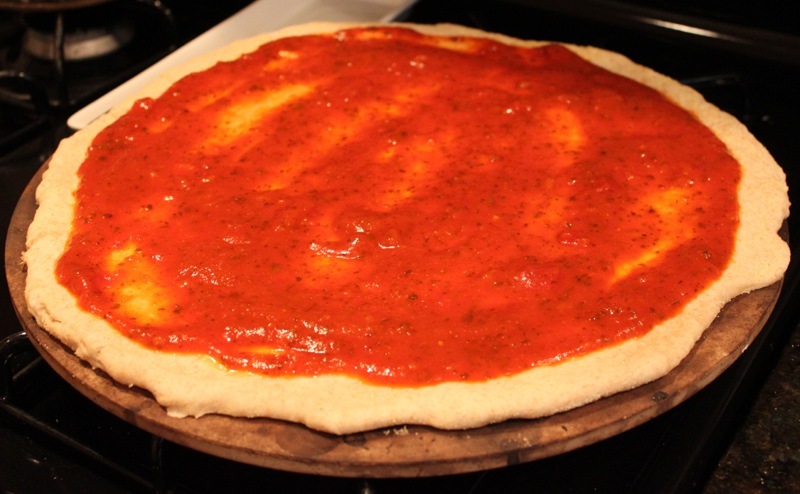 Step 6: Spread the sauce on the dough and the cheese on top of that. …and finally the onion slices. 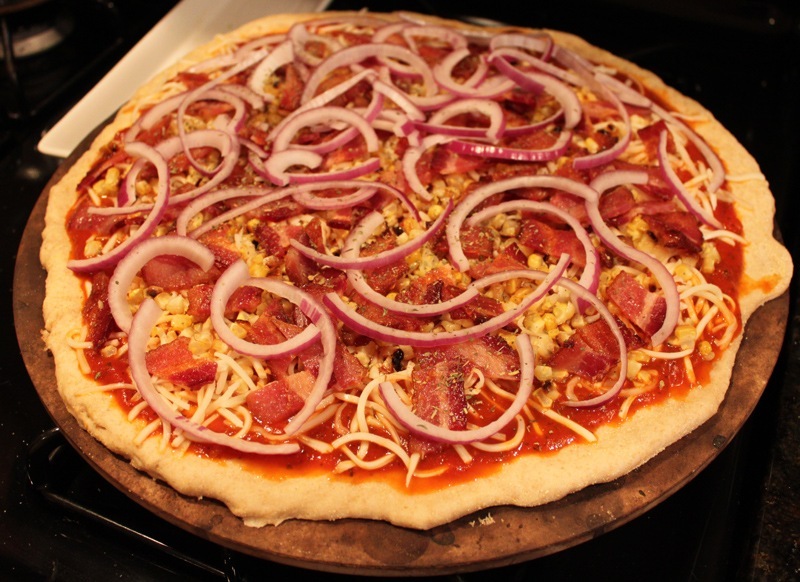 Step 8: Bake on 400 degrees for 10-15 minutes or until the cheese has browned and the onions have crisped up. 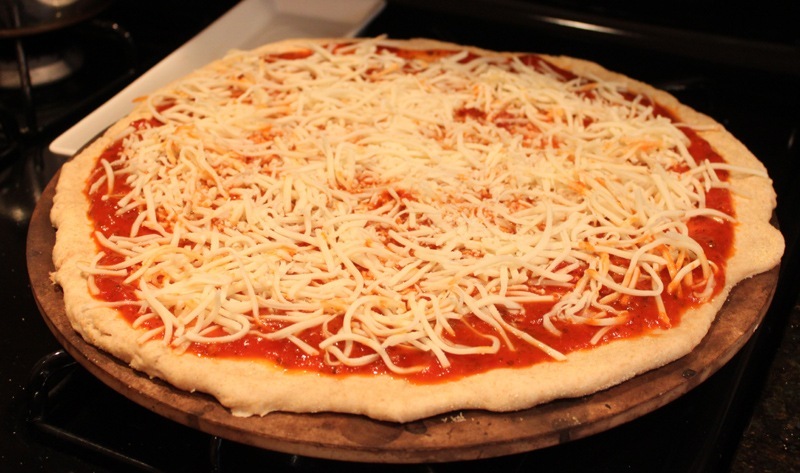 Step 9: Let the pizza cool for 10 minutes, slice up, and enjoy! 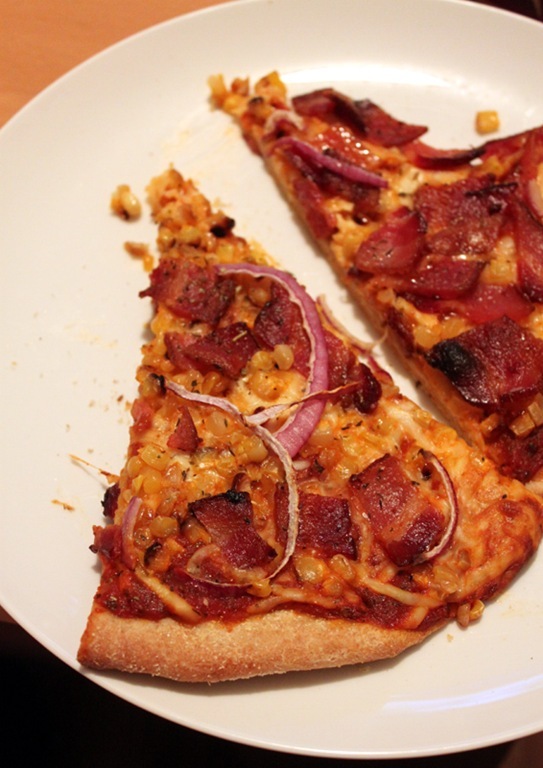 Pizza Sundays are great no matter what…but I think they just got a little better. What a fun way to get ready for the week ahead! Exactly, it’s a nice little just-us routine.